Background: Eukaryotic cells contain ATP-driven proton pumps known as vacuolar H+-ATPases (V-ATPases) that acidify intracellular compartments and translocate protons across the plasma membrane (1,2). Intracellular v-ATPases play an important role in endocytosis and intracellular membrane trafficking, while plasma membrane v-ATPases are important in processes such as urinary acidification and bone resorption (1,2). Vacuolar ATPase enzymes are large, heteromultimeric protein complexes with component proteins found in either the V1 peripheral domain or the V0 integral domain (2). 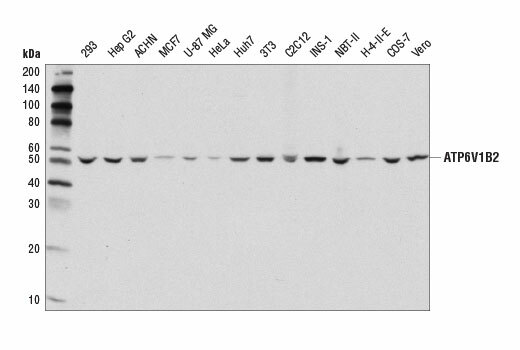 The cytoplasmic V1 domain contains a hexamer of A and B catalytic subunits, as well as a number of other protein subunits required for ATPase assembly and ATP hydrolysis. The integral V0 v-ATPase domain exhibits protein translocase activity and is responsible for transport of protons across the membrane (2). 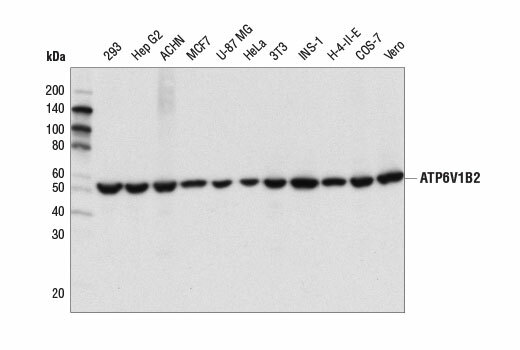 Research studies show that the v-ATPases ATP6V0c, ATP6V0d1, ATP6V1A, ATP6V1B2, and ATP6V1D interact with the Ragulator protein complex and are essential for amino acid induced activation of mTORC1 on the surface of lysosomes (3).